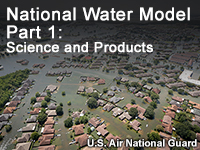 This lesson provides an introduction to the benefits, important input (forcing data), and key products of the National Water Model. Both official and evolving products are presented. The lesson uses the flooding associated with Hurricane Harvey in August 2017 to demonstrate key products. I thought this course was worth it. Need more examples. This course would be very useful for an operational forecaster to establish a better understanding of the National Water Model. Wanted to learn about the NWM but it also had hurricane/tropical storm track info that I'm not familiar with. Otherwise, good training! Have a tasking to compare some of the weather model parameters we might be using with a operational model that outputs specific parameters such as what NWM does. Very helpful. Good training that describes the new features in the NWM. Good introduction, but in this day and age was expecting more mixed media. The Harvey examples would be better placed at the end of the lesson after the NWM explanation and facts are delivered.Many questions lumped too many concepts and facts. These would be better delivered, understood and remembered if they contained more concise facts. This lesson is severely lacking in the physical structure of the mechanisms used to simulate distributed runoff from the National Water Model.